Put simply - your eyesight matters to us. At Atkinson Eye Care, we provide a total range of professional eye care services to help you see sharp. Whether you require an updated prescription, a new pair of eyeglasses, or complex treatment for ocular disease, we will treat you expertly and compassionately. 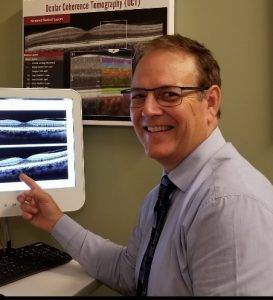 Our experienced eye doctors and optical staff relate to each patient as a unique individual - and will customize your appointment to address your personal needs. We equip our Algonquin clinic with cutting-edge technology, so you can depend upon precise and detailed diagnoses. New and better treatments are developed all the time, and our eye doctors keep watch on the latest developments in optometry. Vision testing and comprehensive eye exams are common reasons to visit your optometrist. However, our list of exceptional eye care services is much longer! We are a family-friendly practice, and we offer vision treatment and correction for all stages of life. We warmly invite Algonquin patients of all ages to schedule a visit to our pleasant and modern office. From performing gentle pediatric eye exams to recommending helpful devices for low vision, we strive to optimize your healthy vision! Eyeglasses and contact lenses are not all the same. Our opticians are knowledgeable about the best eyewear to suit your vision and lifestyle considerations. We feature a wide array of designer frames and premium lenses in our optical collection, and we’ll help you sort through the options for the perfect (great looking!) solution. If you’re interested in LASIK or a different refractive surgery, we will co-manage your procedure within the comfort of our clinic in Algonquin, IL. If you suffer irritation from Dry Eye Syndrome, we can offer lasting relief. In the event of an eye injury, infection, or eye emergency, there is no need to always dash to your primary physician or hospital emergency room. Our eye doctors are qualified to treat many eye emergencies; please call for guidance. In addition, patients who are homebound or reside in assisted care should call us to arrange a home visit. If you can’t come to our office in Algonquin, we will be glad to come see you! Is it too difficult to visit an eye doctor? We offer eye exams and glasses at your home or elderly care facility. Learn more about what we check for during your an annual Atkinson comprehensive eye exam.